I did it! I finally finished this series! You’ll remember that I enjoyed the movie Annihilation, so I read the source material of the same name and found myself … less impressed. I let a bit of time pass by and then gave the second book–Authority–a chance. It also failed to win me over. So you may be wondering why I bothered to read the third book called Acceptance. I’d like to say I’m a completest, but, if I’m being honest, I just wanted some kind of answers regarding Area X and the Southern Reach. I’ve got some good news–Acceptance proved more enjoyable than its predecessors. Everything about Acceptance was superior to the first two installments. I particularly found the narrative style effective. VanderMeer elects to alternate chapters between Ghost Bird, the Director, the Lighthouse Keeper, and Control. By doing this, we are given access to the thoughts of characters we, other than Control, haven’t really before experienced. The fact that we were just as ignorant as the characters in the first two books regarding the events plaguing them frustrated me to no end. With Acceptance, we finally experience revelation … sort of. More on that in a moment. Now, I’m the first to admit that the main reason I liked Acceptance is because it finally gave me some insight into Ghost Bird, Area X, Southern Reach, the Lighthouse Keeper, and the Director. Trudging through the first two books should not be a prerequisite to liking the third, however, and I realize this position is a little contradictory. By the way, the irony of the third book’s title did not escape me. But, the truth is the truth. If you read Annihilation and Authority, I guarantee you’ll find Acceptance worth your while. Be prepared, though. While it revealed enough to satisfy me, you won’t get much in the way of hard and fast answers. VanderMeer sets the stage well enough to let your own imagination fill in the gaps, but there is no concrete conclusion to The Southern Reach Trilogy. Like you, I thought the movie trailer for Annihilation looked very cool, so I thought I’d check out the source material. When the novel of the same name arrived at my local library, the volume’s slimness surprised me. At only 195 pages, I knew it would prove a quick read. Of course, it may be helpful to know this is only the first of a three-book series. All three collected volumes are known as Southern Reach Trilogy. The three installments appear to have been published within months of one another, so that could explain the page count. 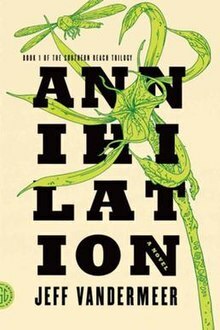 Whatever the case may be, I have to admit that Annihilation by Jeff Vandermeer immediately felt like a bad fit for me. The prose in this book is … dense. It’s full of description largely pertaining to foliage and biology. Also, a first-person narrator delivers the story to us. I don’t know if it’s Vandermeer’s style or the style of his narrator, but I found the prose clunky and difficult to follow. To me, the sentences did not flow very smoothly which forced me to read and reread in a way that frustrated. When Vandermeer’s characters spoke, this issue largely disappeared. The dialogue flowed freely and felt natural. The plot itself interested me enough, but things moved rather slowly. In my opinion, there is no real “revelation” that makes the book a worthwhile, satisfying experience. Perhaps the other two books provide this experience. I’m not sure I’m inclined to read them, though. The good news is that, as I said, this is a very slim book and so you can easily read it in a day or two and prove me wrong. I have been wrong about books before. I’ve even reread a few books to find that my opinion of them changed completely. I still plan to see the movie, but, if I’m being honest, not much that I’ve seen in the trailers evokes much from what I read in the book. This book touts itself as “The Illustrated Guide to Creating Imaginative Fiction,” and that’s an accurate statement. In fact, the illustrations were really what set this book apart. Vandermeer offers great advice concerning fiction writing, but to be honest, it’s fairly standard if you read many books concerning the topic. The illustrations, however, were weird, unique, and beautiful. Additionally, though they came from many different sources, they each served to reinforce what ever point Vandermeer made. By the way, just so you know, he uses examples from his own fiction quite a bit. Furthermore, Vandermeer collected vignettes from various sources focusing upon authors and their advice or thoughts concerning the craft. These were a delight to read, especially Neil Gaiman’s. Other notable authors include George R.R. Martin, Ursula K. Le Guin, and Peter Straub. 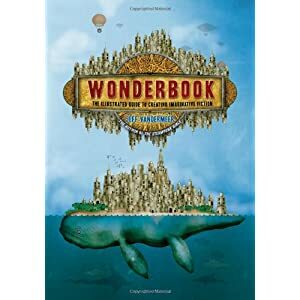 All in all, if you’re looking for an unconventional book to help you hone your fiction writing, Wonderbook fits the bill. Even if you don’t find Vandermeer’s insights stimulating, the illustrations should serve to inspire you.